PlantEaters Tip: What do I do if I am vegan and have no interest in seeing vegetarian meals? That’s easy, just click on the magnifying glass at the top-left of the Map, which brings up the Search page. Check the “Vegan Meals Only” box. 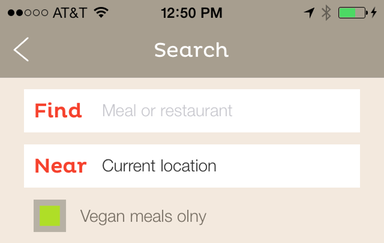 This will ensure that you only see restaurants on the map that have vegan meals available. This entry was posted in Uncategorized and tagged Tips. Bookmark the permalink.